If you’re like me, even if you’re trying to eat healthy, you want to eat something substantial that’s going to stick to your ribs. There’s always going to have to be the fruits and veggies and lots of water thrown in. But in order to stick to a healthy eating regimen, including meals that are satisfying goes a long way in being able to maintain a healthy lifestyle. 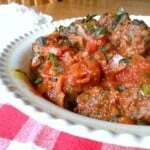 I found this recipe for North African Meatball Stew in my Weight Watchers Ready, Set, Go Cookbook. I love the fact that it’s a dinner recipe for only a 5 Weight Watchers Points Plus Value. I’ve always loved Mediterranean influenced cuisine, so I knew I would love this dish. 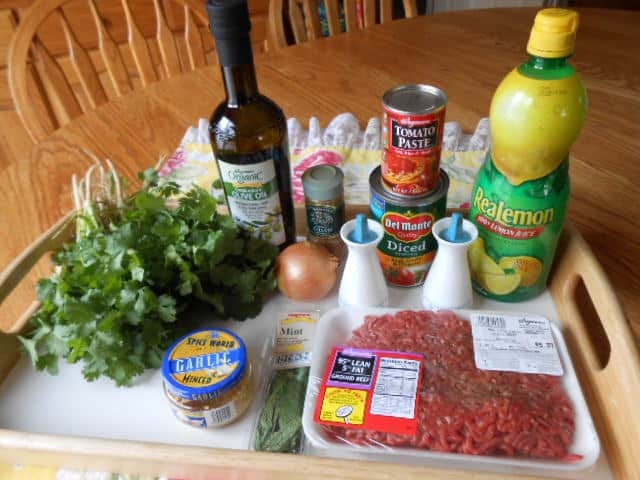 Mix together beef, cilantro, 1 teaspoon of cumin, 1/4 teaspoon of salt, and 1/8 teaspoon of pepper in large bowl just until well combined. 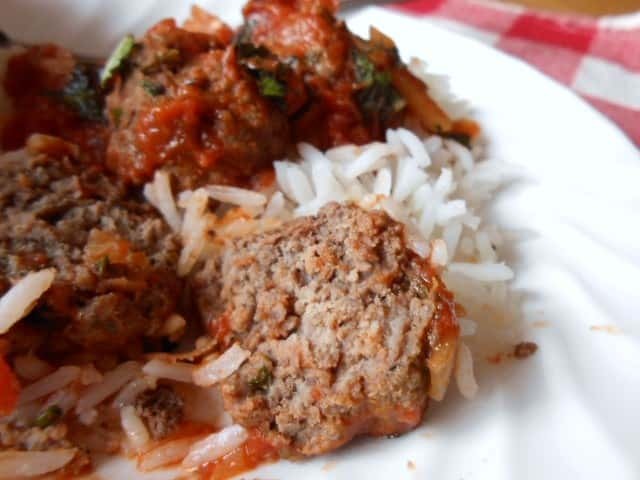 With damp hands, shape mixture into 24 (1 inch) meatballs. Heat oil in large nonstick skillet over medium heat. Add onion and cook, stirring, until softened, about 5 minutes. Add garlic and cook, stirring, until fragrant, about 30 seconds. Stir in tomatoes, water, tomato paste, and remaining 1 teaspoon cumin, 1/4 teaspoon salt, and 1/8 teaspoon pepper; bring to boil. 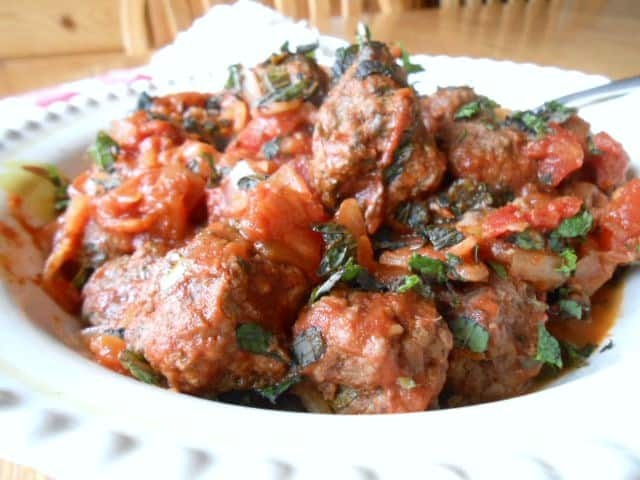 Add meatballs to skillet. 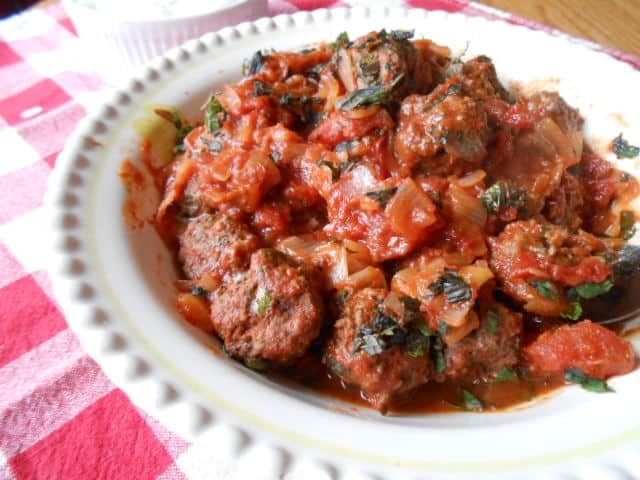 Reduce heat and simmer, covered, until meatballs are cooked through and sauce is thickened, about 30 minutes. Stir in lemon juice and sprinkle with mint. 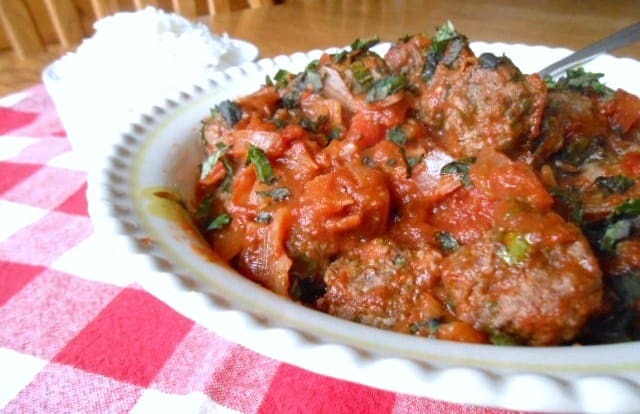 The recipe suggests that the meatballs be served over top of 2/3 of a cup of cooked whole wheat couscous, which would add an additional 3 Points Plus Value. Couscous is a very common side dish in North African cuisine and I love me some couscous! But since my son won’t touch couscous, I opted to serve it with jasmine rice. It turned out really good! My husband loved it. I loved the Mediterranean taste of it. 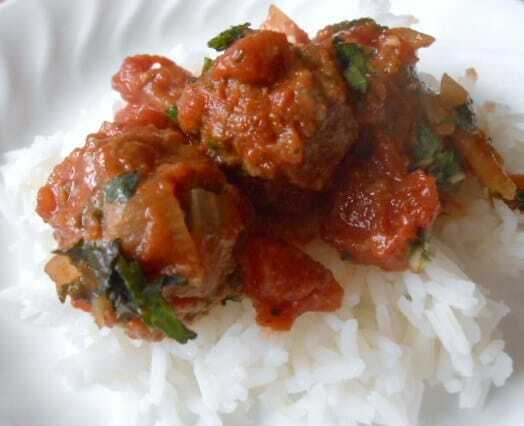 I have to say the cumin and mint, which are common North African cuisine staples, really made the dish. This dish would be really good with some cooked carrots or zucchini. Bottom line is, just because you might be on a diet, that doesn’t mean you can’t step outside of the box a little bit and try some different types of dishes from around this beautiful Earth we live on! This looks absolutely delicious and different–can’t wait to try it!!! Thanks!!!! It really is good & healthy too!